Peaceful protests in Labadee, Haiti prevented Freedom of the Seas calling at the cruise port. 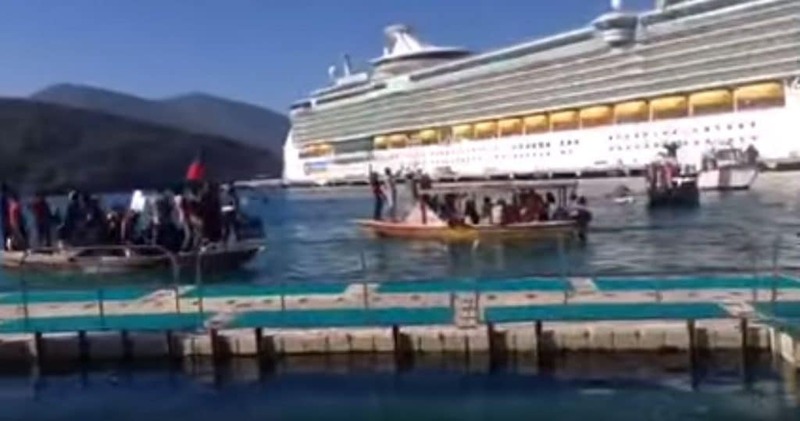 Even though the protests were loud it did prevent the large Royal Caribbean ship from letting passengers visit the port. Locals staged the protests from small boats as seen in the video below. The local people were protesting due to the country’s recent elections. Freedom of the Seas was already docked at the port but no guests were allowed off. The cruise line said the protests would affect guests ability to enjoy Labadee. As a result the ship departed Labadee and spent a day at sea. Royal Caribbean is in contact with the local authorities as future calls at the port could be at threat. Freedom of the Seas is sailing a 7-night western Caribbean cruise which departed Port Canaveral, Florida on January 17. The ship called at Falmouth, Jamaica today as scheduled. Freedom of the Seas is 160,000 gross tons making it among the world’s largest cruise ships. Construction has officially started on the fifth Oasis-class cruise ship at the Chantiers de l’Atlantique shipyard in France.